It is our vision to play an active role in protecting a bio-diverse environment in a densely populated human community. We are a passionate group with diverse talents and experiences. Our board works with community leaders to promote our mission, formulate policy, steward donor and member contributions, and provide oversight. Please join us at monthly meetings on the first Monday of each month, October through May. You can engage with plant, animal, and human communities in a variety of ways including many free field trips. You can visit and experience nature anytime Moccasin Lake Nature Park is open, volunteer to be a bird steward for beach nesting birds, or donate to provide the foundation to support our mission. The Wild Raptor Sanctuary educates the public about the importance of wildlife and habitat conservation with the help of our non-releasable birds. Our feathered teachers host programs at MLNP, visit schools, and participate in large public events such as the Great American Teach-In and Raptor Fest. The Gulf Coast is renowned for its spectacular assemblages of shorebirds, raptors and many wading birds, yet there are innumerable reasons why this region is considered one of the birding world’s preeminent destinations. Discover how we can all make a difference with hands-on stewardship activities to preserve our habitats. We have many projects to become involved with as well as opportunities to share your talents with others. We invite you to become volunteer Citizen Scientists and make a measurable difference in our environment and quality of life. In essence, Community Science is 'Citizen Science' conducted by members of a community of stakeholders; be they professionals or concerned individuals. It involves research conducted by members of the public, often with the help or supervision of a professional scientist or scientific institution. Most trips are led by volunteer Clearwater Audubon Society leaders. Unless otherwise indicated, they are free and open to the public, but reservations are requested. 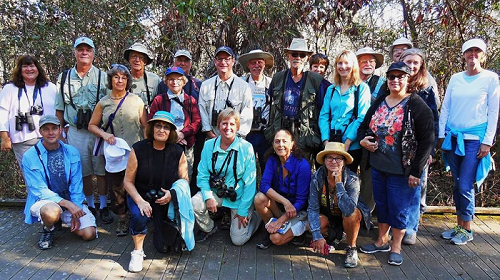 We host monthly guided bird walks at Moccasin Lake Nature park which is free to the public. Discover birds and make new friends with us as we promote awareness, understanding, and stewardship of the natural environment through birding. Our uniqueness stems from our strong commitment to both environmental education and inquiry-based learning. Hands-on experiences forwards our motto of "Conservation through Education" for all ages. We are an active society with a diversity of talents. Get to know us.